I first saw the JPL photo of a rock that suddenly appeared in front of Mars Exploration Rover Opportunity on FoxNews.Com on January 17, 2014. Occam's razor would probably go along with the idea that the rock was kicked up by a wheel of Opportunity, or perhaps that it was part of the ejecta that resulted from a nearby meteorite strike. The first of these possibilties is eventually what JPL gave us as the explanation, but for historical purposes let's also look at other suggsted possibilities. One fit in with our evidence that the Martian atmosphere is considerably denser than NASA admits. The possibility was hinted at by Bill Nye the Science Guy on this FoxNews.Com link. At 1 minute 22 seconds into the video link Nye says, "Now there's a lot of wind on Mars, but the Martian atmosphere is very thin. Was the wind strong enough to blow this cookie pebble down into the view, or call it a rock down into the view? Or did the wheel break it off or did it break it off from some breaking, protruding rock, what rock was that and why does it have all these elements that you wouldn't expect?" The rock has far more magnesium (1.738 grams per cubic centimeter), sulfur (1.84 g/cc) and than any Martian rock seen so far, with a manganese (5.03 g.cc) content that is twice as high other Martian rocks suggesting that it came from off planet via meteorite strike. Actually, this is not the first time that rocks have apparently moved on Mars. However we have seen sand dunes moved and rover tracks filled in with sand when the winds at accepted pressures were not enough to do so. Figure 1 above: Before and after photos of a new object that appeared before Mars Exploration Rover Opportunity. Figure 2 below: color photos of the area of concern. White lines on Figure 2 show two areas of possible pebble movement. Figure 3 - There are a few other differences in the placement of small pebbles on the photos shown below. Figure 4 is the same as Figure 3, but color inverted to make position changes more visible. There is a video that suggests the "rock" is not a rock at all, but rather it's a life form like a mushroom that grew on the spot. Mushrooms do contain three elements seen on the object: magnesium in high amounts, manganese in trace amounts, and sulfur in sulfonic acid. The speculation that it is a fungus was growing on the Internet before JPL announced that it was a rock kicked up by a wheel on Opportunity. The speculation was that it is an oyster mushroom, perhaps the result of contamination from a spore carried by the Mars Exploration Rover Opportunity. Are we looking at contamination from Earth? We were about to write that bacteria had survived for over two years on the moon on Surveyor 3. This is what NASA claimed for most of the time since Apollo 12 recovered the camera from the earlier lunar probe, but when a reference was sought for the earlier claim, what emerged was a study in 2011 that revealed the original claim was bogus. “We are the nose of Curiosity” says SAM (Sample Analysis at Mars) principal investigator Paul Mahaffy. During initial check out tests of SAM, scientists discovered the amount of air from earth’s atmosphere remaining in the instrument after launch was more than expected. As a result, a difference in pressure on either side of tiny pumps led SAM operators to stop pumping out the remaining air as a precaution. The pumps subsequently worked, and a chemical analysis was completed on a sample of earth air. “As a test of the instrument, the results are beautiful confirmation of the sensitivities for identifying the gases present,” says Mahaffy, who adds the initial indication of methane caused a brief flurry of excitement until the terrestrial origins of the gas were recognized. Figure 5 color comparison of the new "rock: with an oyster mushroom. WHERE WAS OPPORTUNITY WHEN THE ROCK APPEARED? The photos shown are labeled as having been taken on Sol 3528 and Sol 3540. There are only 669 sols in a Martian year. 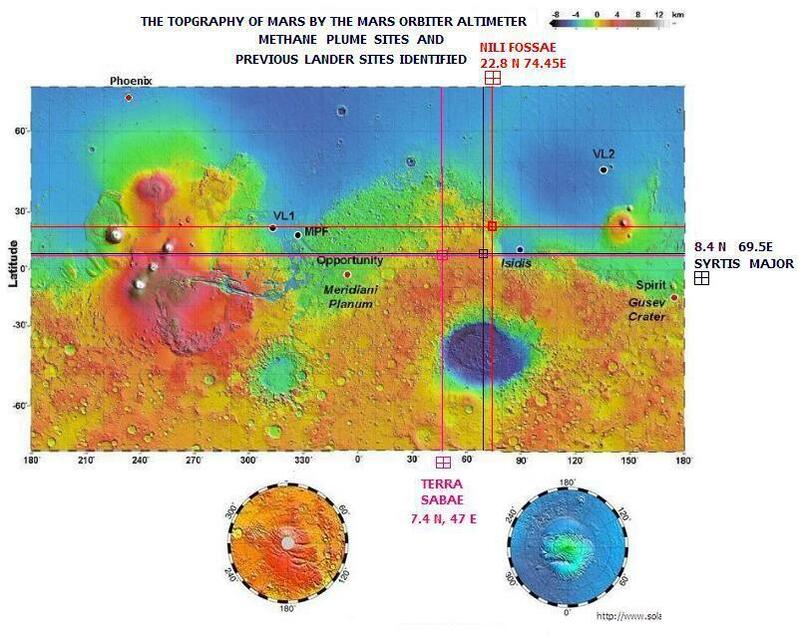 In doing the math from the time Opportunity landed on January 25, 2004 at 1.95 South 354.47 East, the two pictures represent about Mars Sol 145 at Ls 67.9 on December 27, 2013 and Mars Sol 156 at Ls 073.2 on January 8, 2014. In the southern hemisphere of Mars this corresponds to the fall season although the site is not far south of the equator. 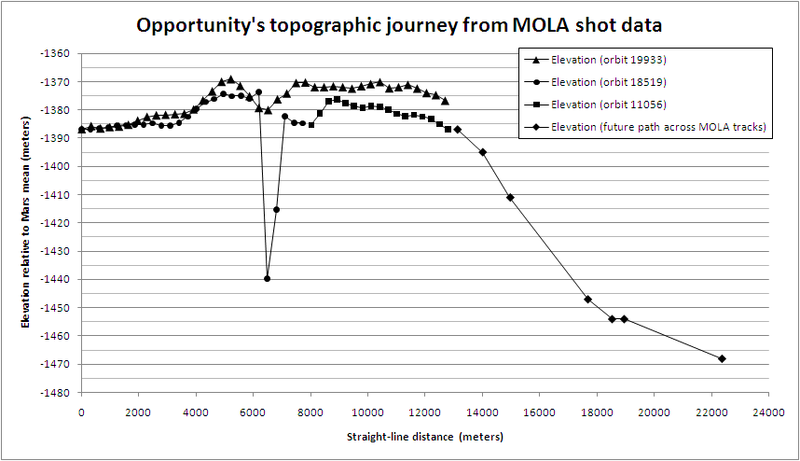 In looking over the topographic travel record for Opportunity it seems like most of the time since landing the rover's MOLA altitude has been around 1,370 to 1,470 meters below Mars Areoid. The lander has no weather instrumentation on board. Note: Figure 6 below shows that the rock was not yet visible on Sol 3536 - four days before it showed up on Sol 3540. It also shows the rock on Sol 3541 - one day after it appeared. Figure 6 shows a rock that JPL scientists are now claiming was affected by Rover treads, causing the controversial rock to be kicked out. For closeups of the two rocks see the two photos in the lower right portion of Figure 7. NASA/JPL eventually announced that the new rock was probaly kicked up by the rover as it moved. The source rocks they say is shown on Figures 6 and 7, however while the rover tracks clearly pass over their claimed source rock, the tracks do not appear to be over the new rock so the issue is whether the new rock could have been pinched off and launched airborne. The Opportunity has a top speed of 50 millimeters (about 2 inches) per second (0.111846814603 miles per hour) and an average speed of about 10 mm/sec. It stops once every 10 seconds for 20 seconds to observe and understand terrain that it has been over. Figure 7 shows the area on question on Sols 3536 (4 days before it appeared) and 3541 (one day after it appeared). The map in the lower left corner shows where Opportunity landed. The two photos in the lower right show a closeup of the suspect rock and new rock shown on Figure 6.